This is the 238th edition of the Epileptic Gibbon podcast music show and the playlist to accompany it. You may be able to CLICK HERE TO DOWNLOAD but note the shows are large files & this may not be the best way to listen. If you prefer, you can subscribe to the show via iTunes by sticking feeds2.feedburner.com/TheEpilepticGibbonPodcastMusicShow into the ‘Subscribe to podcast’ area & then you’ll get the new shows as they become available (BUT please let me know if this subscription isn’t working). The show is also available to stream via Mixcloud and the Progzilla Radio Network (the show appears on Progzilla in alternate weeks). This is another show that had to be put together somewhat on the hoof, plus I was a little under the weather whilst doing so, but hopefully you won’t notice any drop in quality (certainly not in the music played). I’ll be focusing largely on new music from 2018, but with the occasional diversion into the past. As part of the latter we have a feature album, which is ‘The End is Beautiful’, the 2005 album by the American band Echolyn so you’ll hear three tracks from that. 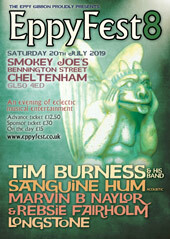 And otherwise we’ll be covering the usual diverse selection of styles and genres, plus there’s a final reflective nod back to EppyFest 7, a look forward to The Whole World Window festival on 11th August, and best wishes to Michael Nesmith of The Monkees following his recent surgery. Below you’ll find the track list, plus weblinks from where you can find more information about each artist. Total running time: 2 hours & 16 minutes. Downloaded file is 124.1 MB. Thanks to all the musicians who contributed and to all listeners. Send us comments if you like what you hear (or even if you don’t… feedback is so important!). If you want to keep up to date with news about the show, EppyFest, or just chat with other listeners, don’t forget that there’s a Facebook group – just search for the Eppy Gibbon Podcast Show on Facebook and request to join, plus don’t forget that we’re now part of the Progzilla Radio Network. Eppy will be taking a well-earned break so next time Rebsie & Daniel will again be sitting in for him, so we hope to see you back for another of their takes on Eppy Gibbon music.